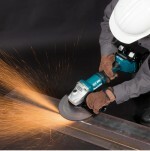 MAKITA has introduced two heavy duty cordless angle grinders to its industrial range powered by twin 18v batteries to give 36v power to the brushless, high performance motor and says these new cordless grinders deliver remarkable mains machine type performance with the added benefit of total manoeuvrability. Makita says a host of new features, especially in the machine electronics, ensures maximum operating productivity and at the same time affords a high level of protection for the machine and the operator in tough industrial application. The new Makita LXT 180mm DGA700 and 230mm DGA900 angle grinders are both powered by high torque Brushless motors that will run up to 7,800 rpm and 6,500 rpm respectively. Maximum wheel thickness can be 7.2mm for the DGA700 and 6.5mm for the DGA900. MAKITA reports it has launched its first cordless twin 18V LXT Brushless Angle Drill featuring all the power and performance of a mains machine whilst benefiting from the freedom and manoeuvrability that only a battery powered tool can provide. The DDA460ZK is powered by two Makita 18V LXT Lithium-Ion batteries giving 36V power from the Brushless motor which not only extends runtime but substantially increases power. Cleaner steels by OVAKO are said to be opening up new design opportunities and extending service life for high performance parts. 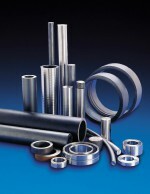 Ovako says today, more than ever, high performance components are expected to withstand higher loads over longer periods of time and the company says its clean steels can facilitate significant opportunities to rethink design solutions for improved safety, time and cost savings in a range of applications. Compressed air specialist BOGE has launched the BOGE airstatus, a new remote diagnostic tool designed to deliver maximum control and reliability. Boge says in the age of the computerisation of manufacturing, its pioneering technology redefines and enhances the communications between man and machine and supports users to optimise compressed air performance. MAKITA says its angle grinders are recognised as rugged, hardworking machines serving many areas of industry including steel work, construction and heavy duty plant maintenance. The company says now a new generation of six 180mm and 230mm mains powered grinders has been launched, bristling with a host of new features and proven technology. 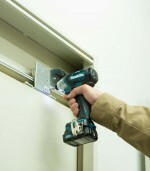 Makita says all are powered by a new, heavy duty 2,000 watt motor specified for tough industrial operation and a new design of rear D-shaped handle protects operator’s hands from contact with the material surface and a new design of side handle provides more comfort and greater machine control.